"If they lose this one they'll be below 500." Me: Where should they be? 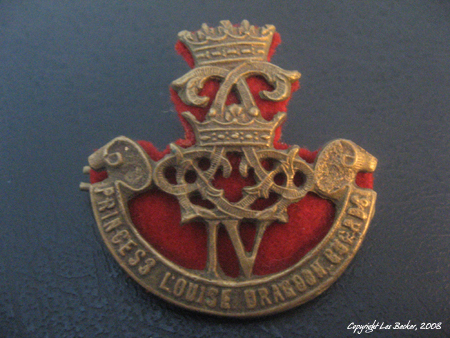 On 26 January 1941, the Regiment mobilized the 4th (Active) Princess Louise Dragoon Guards. This unit was converted to armour and redesignated 4th Reconnaissance Battalion (4th Princess Louise Dragoon Guards) on 11 February 1941. The battalion was formed from personnel from 1st Canadian Infantry Division in the United Kingdom together with reinforcements from Canada in July 1941. On 08 June 1942, it was redesignated as 4th Reconnaissance Regiment (4th Princess Louise Dragoon Guards). My dad was stationed in Belgium for his first gig during World War II. It was there that he contracted diphtheria and ended up on a wild back-and-forth middle-of-several-nights not-what-we-might-call-an-ambulance ride with two hot Australian chicks between Ostend and Amsterdam and a hospital ship that would (eventually) sneak him successfully to hospital for months of recovery. Prior to his grand contagious escape, my dad’s job was to “guard” an outdoor sports arena. He wasn’t guarding it from the Germans – they were being kept out of Belgium fairly handily by 1943-44 – but from the locals. This arena was where they would come once a day, lined up and dressed in their very best clothes, carrying any container from their pantry they could carry, to pick up food passed out by Canadian Army personnel off a truck. He said it was a strange sight – all these folks dressed up in their finery, waiting for a meal with cooking pots in their hands – even the kids. It was a little kid that made him realize that he didn’t have a clue what he was doing there…. Dad’s job during the daylight hours was to keep the people cordoned off while other personnel were unpacking the trucks and setting up tables and food, etc. Officers ate first, followed by infantrymen, and then the townfolk got their share. Sometimes, understandably so, I think, this made them a little impatient. It was up to my dad to be tough, cruel and frightening, and order them back beyond the barrier to wait their turns. My dad was 23. Ha. He said, most times, all he had to do was wave his gun menacingly and growl and they would settle down. He growled because he couldn’t speak the language. He waved his gun because he didn’t know what else to do with it. His gun was a bit of a joke, anyway, he said. It was a “sten gun”, jumbled together from metal pipes and “you wouldn’t recognize the thing as a gun at all, unless you knew what it was.” It worked, though; it was actually a formidable weapon, firing automatic 303 cartridges. My dad pronounces “303” as “3-aught-3”. He’s Canadian, you know. Sometimes, at night, he would be assigned to guard a certain path into the sports arena – one designated for soldiers only, and he was to turn back all non-military personnel with no exceptions. Sometimes, locals would try to get by him with fake ID cards, crudely put together that had no hope in hell of passing for anything official. This part of the job was boring, and sometimes for a lark, my dad would pretend to be greener than he was, and be “fooled” by the most ridiculous-looking, fakest-looking card that was passed to him, and let the guy holding it through. He said that usually the guy would have a hard time keeping the surprised look off his face and continue down the path. One day, while standing behind the cordon between the food and the people, my dad started having trouble with one little girl and her family. He would shoo them back, and turn to keep an eye on everybody else, and when he looked back again, there they would be, sneaking under the cordon, that little girl, especially. Finally, he’d had enough. He watched from the corner of his eye as the little girl snuck further and further, and then suddenly ran at her, yelling at the top of his lungs. Had he done this to one of his own kids in later years, it would have put the fear of the devil himself into whichever one of us he was yelling at, but this kid stood there and stared him down. He didn’t know if she was paralyzed with fear, or standing defiant, but he kept yelling as he slung his sten gun over his shoulder and bent down and hooked her up under the armpits with his other arm, stomped to the cordon and dumped her over it. There. He didn’t have his back fully turned before the little brat was back under the rope. He picked her up again and put her back behind it. And she started yelling at him! “Mein kluben! Mein kluben!” and under the rope she came again! He drove her back again. This was not turning out to be a good day. He finally had to resort to standing directly in front of the girl to keep her on her side of the cordon. The kid kept yelling at him. Then she started pointing and yelling. It took Dad a while to figure it out, but he finally realized what she was pointing at. Back behind him, at the spot that he’d pulled the little girl off her feet, were two little wooden shoes, embedded in the mud. He’d yanked her right out of her shoes. Now, my dad loves kids, and even at 23, he had a soft spot for them. He felt really bad. He finally waved her under the cord to rescue her shoes, but he kept a snarly look and growl handy, so as to save face. At the end of the war, my dad went back to Belgium, and into a little shop. He bought a pair of small wooden shoes. When I was growing up, he kept them locked in a file cabinet in his den. Every now and then when I was very small, he would bring them out to show me – he even let me put them on and walk around in them once in a great while. They hurt. He never told me the story about why he bought those shoes until just this year. He doesn’t know where the shoes are now – possibly packed away in a box in My Brother the Trespasser’s barn or basement. I wish he still had them so I could have posted a photo. Another odd thing…. I’m not sure if Dad is remembering “Mein kluben” correctly, or if it was a slang term. I can’t find it anywhere in Dutch or German pertaining to “shoes” or “clogs” or “wooden shoes”, but that’s what he swears the little girl was yelling. Anybody out there have an inkling…? I’d love to know. 15 Responses to Mein Kluben! Mein Kluben! Wonderful story about a rare good time while standing post! I had a few of those moments, but like I say…rare. Thanks for the story. I was starving for some Les Becker, and that was quite filling. I always love your dad’s stories! That was a great one. Congratulations on the new job! Thanks for all the finger-crossing; it seems to have done the trick. I love this story…and I can’t help you with the shoe thing…but aught is gun speak everywhere. Not just in Canada. I know this because I live with an American hillbilly and he explained that aught is zero. We have a something that I forgot aught sized gun. I bet there’s some kind story behind the use of that word too! Les Says: “Gun speak.” That’s good; I like that. So how come Horatio Cain doesn’t say “aught”?! I took German in high school (eons ago) and cannot remember the word for shoes, much less clogs. I thought maybe Kluben meant club. I thought she was going to grab the muddy shoes and smack your dad on the back of the head with one of them. Don’t ask me. Horatio is dealing with drug dealers and he carries a pistol or he’s dealing with big automatic weapon type guns. Plus, he’s abnormally pink which has nothing to do with anything but I thought I’d mention it. he looks a bit like a baby rat and speaks like the captain on Star Trek, the first series. Les Says: Ah, yes… good ol’ Bill Shatner. He’s Canadian, you know. We all talk like that up here (we’re also all abnormally pink if you put us in the sun). “H” is just a Canuckian Wannabe. It’s true! OK, geek moment. It’s actually a Sten gun, and it fired 9mm rounds. Ok, my job is done. Seriously, cool story. Love those old stories about real people in the war. Any war. Les Says: Oops! Checked my notes – apparently I can’t tell my N’s from my M’s… 😉 I’ll fix that ASAP. Dad DID say “303”, though… is that the same as 9mm (Horatio would know; let’s go to Miami.)? Now, it might have been a Bren gun. That one did shoot .303, but it was a heavy machine gun. Not what a sentry would carry. See, you’ve unleashed the geek. Sorry I’ve been AWOL. What a gem this is, Les. Les Says: That’s okay, David – I’m a bit of a slack-off MP, anyway… you know… being a girl and all. Glad to see you here again! Did you bring cake? As far as wars go, the young lady’s shoes were a minor casualty. That fact that your father took it so hard ays much of his compassion. It is good he had the post he did. Les Says: I hadn’t thought of it like that, I must say… I wonder what he’ll say if I tell him a reader thought he must be very compassionate – he’s not altogether very outspoken about “feelings”. He’ll probably snort a lot. What a wonderful post. My Poppa served in WWII, in a tank. He never spoke about the war unless he was good and drunk, which was a rarity, so we never heard much. Les Says: Thanks so much! My dad never liked to speak of the war much until recently. I’m glad he’s starting to, now. Les Says: Welcome to Where the Walls are Soft, Sandi! Hope to see you again! Hey cool dad story. Up to mah patoot in alligators here, but hey it’s a freaking swamp, so what did I expect? Les Says: Omigod, Elle! ALLIGATORS?! Les Says: Yeah. I know aaaalllll your secret identities, Betch. congrats on post of the day! I am here from david’s blog. Thanks for the good war story!! Les Says: I got David’s Post of the Day?! Holy ol’ Joe! I’d better get over there and make a speech!